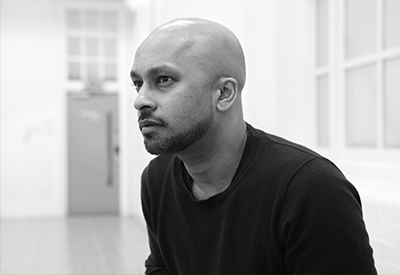 Born in London in 1974 into a family originally from Bangladesh, Akram Khan began dancing kathak at the age of seven. His first public performance was at age 14 as a dancer in Peter Brook’s legendary Mahabharata. He toured the piece around the world from 1987 to 1989, and also appeared in the 1988 televised version. After studying contemporary dance and working on the X-Group project with Anne Teresa de Keersmaeker in Brussels, he presented his first solo works in the late 1990s. Maintaining his commitment to classical kathak alongside his modern work, he developed an innovative and contemporary language of movement. His better known solos include Polaroid Feet (2001), Ronin (2003) and Third Catalogue (2005). He founded his own company in August 2000 with the producer Farooq Chaudhry, which provided him with a platform for innovation and a diverse range of work through collaboration with artists from disciplines ranging from theatre to literature, film, visual arts and music. As choreographer in residence at the South Bank Centre, he presented a recital with Pandit Birju Maharaj and Sri Pratap Pawar, plus A God of Small Tales, a piece for mature women with text by the acclaimed writer Hanif Kureishi. He was the first non-musician to be appointed associate artist (until April 2005) at the South Bank Centre, and is currently an associate artist at Sadler's Wells Theatre. His recent ensemble piece Vertical Road is further evidence of his ongoing desire to explore the relations between different cultures and creative disciplines. Akram Khan brings together a host of performers and artists from East and West. The piece began touring in September 2010. His work Gnosis mingles his classical Indian dance roots with contemporary dance. Working with world-class musicians from India, Pakistan, Japan and the United Kingdom, he brings the opposing worlds of tradition and innovation face to face. Outstanding earlier works include Kaash (2002), a collaboration with Nitin Sawhney and the artist Anish Kapoor, and ma in 2004 (with text by Hanif Kureishi), which received a South Bank Show award in 2005. Other recent works include In-I (2008), a duo with Oscar-winning actress Juliette Binoche and visual design by Anish Kapoor; (2008), a collaboration with the National Ballet of China; Sacred Monsters (2006), a duet with the ballerina Sylvie Guillem; Variations (2006), produced in conjunction with London Sinfonietta to celebrate the 70th birthday of composer Steve Reich; and zero degrees (2005), a collaboration with the dancers Sidi Larbi Cherkaoui and Antony Gormley, and Nitin Sawhney. He has received several awards, including the Jerwood Foundation choreography award (2000); two Outstanding Newcomer to Dance awards presented by the Critics' Circle and Time Out Live (2000); the Best Modern Choreography award presented by the Critics' Circle (2002); the International Movimentos Tanzpreis (2004) for most promising newcomer in dance; the 2005 Critics’ Circle award for outstanding male artist (modern dance); and a South Bank Show award (2005). Akram Khan was also nominated for a Nijinsky Award in 2002. In 2004 he received an honorary Doctorate of Arts from De Montfort University in Leicester for his contribution to the UK arts community, and the following year was named a member of the Order of the British Empire for his services to dance. More recently, he was the recipient of the International Theatre Institute’s 2007 award for excellence in international dance. That same year, he received the best male dancer award and the award for best choreography (zero degrees) at the Helpmann Awards ceremony in Sydney, Australia. He recently also received an honorary Doctorate of Arts from Roehampton University in London. The choreographer is returning for his sixth visit to Montreal, where he previously presented Sound of Archery in 2003, ma in 2006, In-I with Juliette Binoche in 2009 to sold-out houses, Vertical Road in 2012 and ITMOI in 2014.